Jordan is currently Assistant Resident Director on MATILDA (West End) and Associate Director on FLASHDANCE (South Korea). 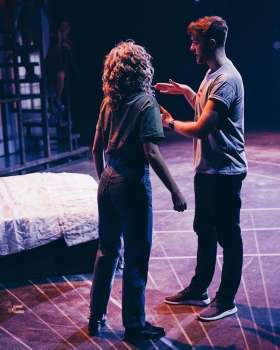 Credits as Director: BREAKING UP IS HARD TO DO (Upstairs At the Gate House), LIVING A LITTLE (Vaults Theatre, London), HONK! (NYMT, Bury St Edmunds Theatre Royal and Rose Theatre, Kingston), DOUBLE BUBBLE (N16, London), THE SURFACE (European School of Alicante, Spain), LIVING A LITTLE (New Wee Theatre, Edinburgh), Off-Broadway workshop of SOMETHING LIKE A FAIRYTALE: A NEW MUSICAL (New York City), THE DREAMING (Chain Theatre, New York City), EDGES (London Theatre Workshop), ZOMBIE PROM, RADIUM GIRLS (Stagedoor Manor, New York), BLIND BET (Hen and Chickens, London), A PLACE CALLED OZ (Russian Cultural Centre, Mongolia). Credits as Assistant/Associate Director: WONDERLAND (UK Tour Dir. Lotte Wakeham) SIDE SHOW (Southwark Playhouse, London Dir. Hannah Chissick), EUGENIUS (London Palladium, London Dir. Ian Talbot & Mike Jibson), THE BUSKERS OPERA (The Park Theatre, London Dir. Lotte Wakeham), SPRING AWAKENING (NYMT, Curve Theatre, Leicester Dir. Nikolai Foster) THE HIRED MAN (NYMT, St James Theatre, London Dir. Nikolai Foster), SWEET CHARITY (NYMT, Leicester Curve, Leicester Dir. Lotte Wakeham). Training: University of Exeter, National Youth Music Theatre (NYMT), Young Vic Directors Programme.